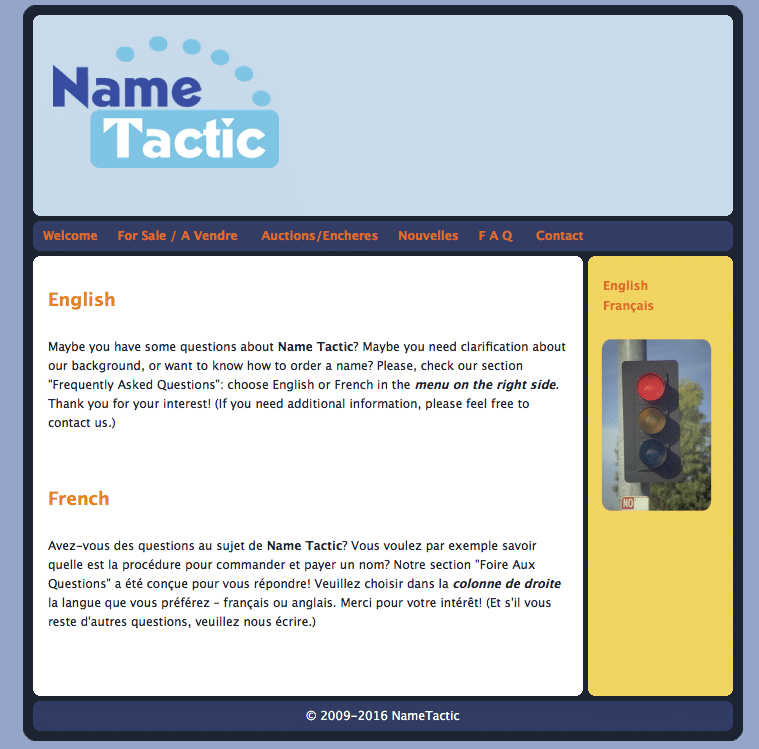 Name Tactic is a small Swiss domaining service, launched in January 2009. It is a private initiative of its founder, Jean-François Mayer. 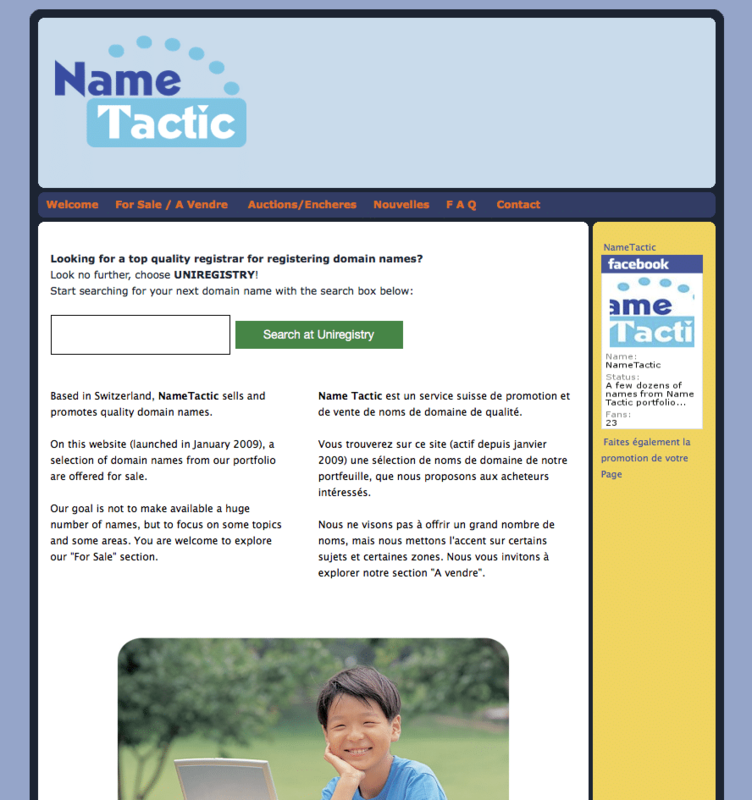 Name Tactic sells quality domain names at moderate and medium prices. For any firm, group, association, and even for many individuals, owning the right domain name has become a key issue: today, it is mandatory to be present on the Web. It is the way to reach a wider audience, and it is central to any public strategy. In some cases, it is useful to own several domain names, related to various products or fields. Our customers can find on our website a selection of carefully chosen domain names offered for sale. Are all domain names in your portfolio listed on this website? No, they are not. A selection of those currently available for sale are listed here. More will be added from time to time or sold on domain name marketplaces. If you want a domain name to remain your property, you need to pay a yearly fee, which is usually quite reasonable, but can vary from one extension (e.g. .com, .net, .org, .info, .co.uk, .us, .tv…) to another, and also from registrar to registrar. The payment can be done for several years in advance (usually up to 10 years). Each extension is under the supervision of a registry; in most cases, you don’t pay the registration and renewals directly to the registry, but to a registrar of your choice. Some registrars offer only a few extensions, other ones dozens of them. In case you do not already have an account with a registrar, you should first open one: very easy to do, and no need to have a domain first. Among US-based registrars, Name Tactic recommends especially Dynadot, NameSilo and Uniregistry. In case you buy an already existing domain name from Name Tactic or from another domaining service, it might be a good idea to open an account with the same registrar as the seller, which will allow in many cases a fast push rather than a transfer. Well, it depends very much of what you intend to do with the domain name? What is your project, what do you intend to develop through the use of the domain name? Seen from such an angle, your view might change. There is no absolute measure of the value of a domain name. In some cases, companies have paid hundreds of thousands or millions of dollars for a single domain name. But most of them are sold at much cheaper prices. Before accepting or rejecting a price, think: what will the name bring to your image? to your communication strategy? to your business project? How much time will you need for a return on that investment? If your take all those parameters into account, your assessment of the value of a specific domain name will be adequate. Remember: in some cases, a domain name is pivotal to a communication campaign, or to the very existence and image of a company. And this does not only apply to for profit companies, but also to a variety of non profit initiatives. When I buy a domain name from you, does it also include a website? No. In a very few cases, we used to offer an existing content – but such a content rarely matched what the enduser intendeds to do with the newly-bought name. What is sold is the ownership of the domain name itself. Creating a website and hosting it is then the responsibility of the buyer. There are many website designers and/or managers as well as many existing hosting services, depending upon your requirements – and some good content management systems allowing you to create a nice looking website with minimal efforts. Most of our domain names are sold on marketplaces. Mostly we are selling them via Sedo or Uniregistry (Uniregistry offers a very simple and fast way, since any domain name registered with them can be transferred to the buyer straight after payment in received – it takes a few days with Sedo). If one of the domain names you want to buy is for sale with Sedo or with Uniregistrey, you will be able to access the page directly. You will need to register either with Sedo or with Uniregistry first – it is fast and free. In both cases, the transaction is simple and secure both for the buyer and for the seller, since the marketplace makes sure the domain is transferred to the buyer after payment, on the one hand, and the seller receives the payment, on the other hand. They act in the same way as escrow services. That domain name business… is it ethical? Isn’t it speculation? For the person selling a domain name to you, there may be many reasons to do so. For a domainer (i.e. somebody buying and selling existing domain names), it is an investment. But many domainers do not limit themselves to buying names and selling them at a profit: a number of them develop Web-based projects, but they do not have enough time for all of them. Moreover, they take risks: they buy domain names (often hundreds or thousands over the years), they pay for them prices that are not always cheap, then they need to pay yearly renewal fees for hundred or thousands of domain names, without any certainty to sell them finally – one domain name is sold, while dozens other domain names remain unsold. If you take all those factors into account, it will become obvious that (serious and honest) domainers are just investors like any others. Moreover, thanks to them and to their foresight, you may find that very domain name of interest to you: if it would have been bought by a competitor, it is very unlikely you could get it some day. This way, your perception of domainers will probably become more positive and realistic. Although the comparison has its limitations, like any comparison, we could compare domain names with real estate. Some properties don’t become more valuable over the years – or their value even decreases, and finally they must be sold a t a bargain price. Other properties at top locations gain more value year after year. Everybody who has travelled to various areas of the world over the past 30 years has probably had opportunities to witness cases of pieces of land or houses of which the price has multiplied by 100% or 1,000% in a matter of a few years, due to changing circumstances. Should their owner still sell them at their original value? Nobody would dare to suggest it! Domain names are very similar to such developments in real estate. If I write to Name Tactic, will you reply promptly? Thank you for paying attention. This is correct. The sitre had been launched in January 2009. It was entirely redesigned in December 2018. We hope that you like the new layout. It was necessary to switch to a more modern design and to adjust to new ways of surfing online, especially the need for responsive sites when reading content on smaller screens (smartphones or tablets). If you did not know the website in its previous incarnation, you can see below two screenshots showing how the this website looked before December 2018.